Yiya empowers students to view themselves as engineers who have the knowledge and skills to design technologies that solve real problems faced by their communities! Our curriculum units equip secondary students to apply the knowledge, concepts, and skills they've learned in school to design and build technologies that can be used to solve real problems. Our aim is to use hands-on engineering challenges to make secondary education more engaging, practical, and relevant to students' lives outside the classroom! 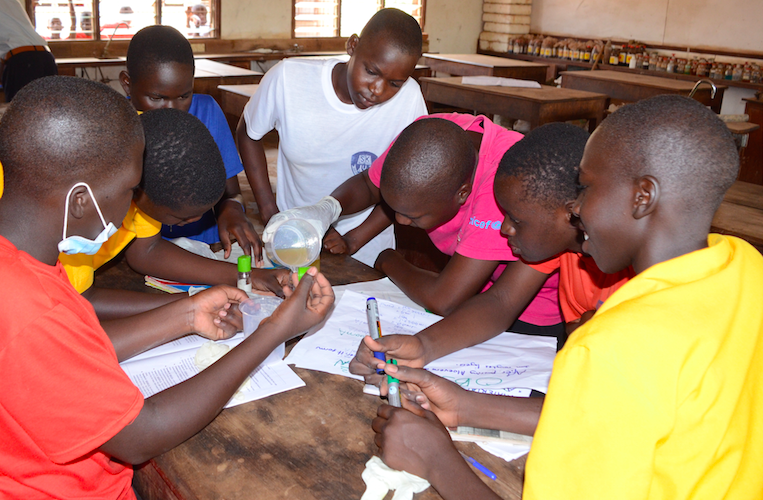 These engineering challenges are closely aligned to math and science topics from the Ugandan national secondary syllabus. In our Chemical Engineering module "Keep 'em clean," student-engineers are encouraged to investigate the problems that dirty hands create in their community. They learn about various communicable diseases, and research the pros and cons of common strategies for tackling this problem (exploring simple technologies such as liquid soap, bar soap, hand sanitizer). The student-engineers experiment with different formulas for hand sanitizers, designing their prototypes to meet specific design criteria and constraints. The bacteria-killing effectiveness of their prototypes is tested agaisnt that of bar soap and liquid soap, in order to assess success! In our Electrical Engineering module "Pedal Power," student-engineers are encouraged to investigate how the problem of inconsistent power supply affects their community and creates challenges. They learn that the principle of conservation of energy (which they have learned about in their physics classes!) can be applied to design a technology to tackle this community problem. Student-engineers explore different electronic components, and create multiple prototypes of circuits that can power first LEDs and then eventually cell phones. Their final product is a bike-powered charging system that can charge a cell phone, giving them independence from the electric grid!